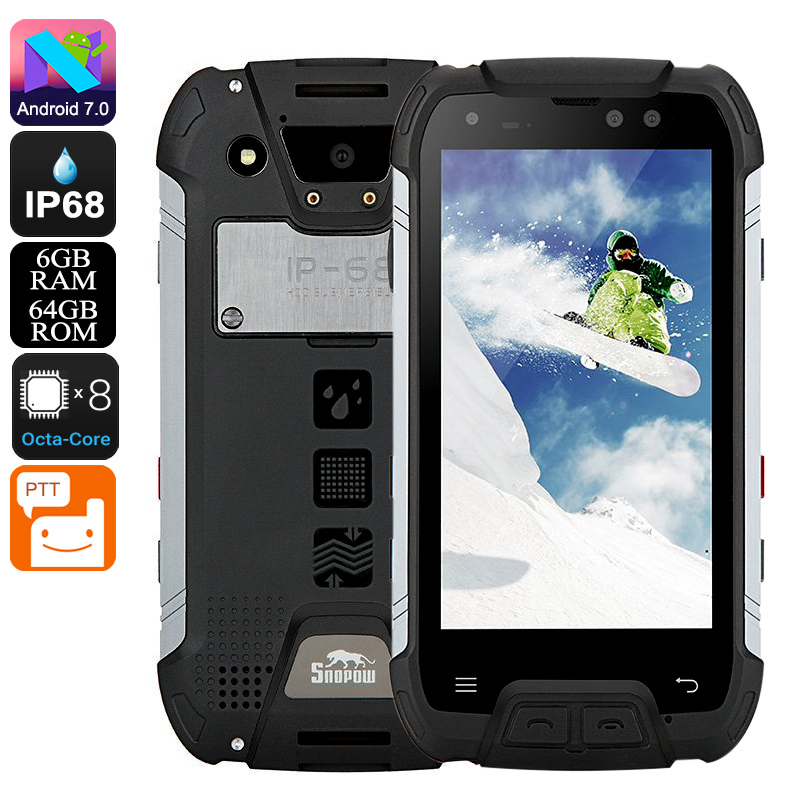 Successfully Added Snopow M10W Rugged Phone - 6GB RAM, Octa Core CPU, IP68, Dual SIM, 4G, Walkie-Talkie, 5 Inch Screen, 6500mAh Battery (Black) to your Shopping Cart. This rugged smartphone brings a winning combination of great connectivity and durable build that makes it ideal for outdoor goers and workers. It has a tough structure thanks to its metal frame and with a rubber outer, it's well protected from dust and water ingress as is indicated by its IP68 rating. The M10W from Snopow can be submerged in water and is immune to dust ingress so its suitable for the harshest environments. Dual SIM card slots and two IMEI numbers allow for you to connect to 2 cell services without having to swap SIM cards. With 4G connectivity for frequencies including B1, B2, B3, B4, B5, B7, B8, B12, B17, B20 you have great network coverage. When you're off the beaten path you can use the phones walkie-talkie function to keep in contact with those around you. when it comes to hardware the M10W rugged phone is well equipped, it has an octa-core CPU and 6GB of RAM - more than enough for the latest games and multitasking with several apps. There is plenty of space for apps and media with 64GB of internal storage and the option to add more with a micro SD card slot that supports up to 128GB of storage. You'll never get lost again with this phones GPS support that pinpoints your location and gives you accurate directions in the palm of your hand. To keep you going for hours on end the phone has a huge 6500mAh battery. This is enough for days of typical usage on a single charge. The Snopow M10W rugged phone comes with a 12 months warranty, brought to you by the leader in electronic devices as well as wholesale rugged phones..